The late Edward (Eddie) Meenan. There were rowdy and emotional scenes at Derry Magistrate’s Court on Friday when two men appeared charged with the murder of Edward Meenan whose body was found in a laneway last Sunday. Sean Rodgers (31), of Little Diamond in Derry, and Derek Cresswell (26), of no fixed abode, were both charged with murdering the father-of-nine on November 25. Before the men appeared in court, District Judge Barney McElholm warned those in the public gallery that it was “a very serious matter”. He said it was his policy not to tolerate any interruptions to proceedings. When the two men appeared, they spoke only to confirm their identities and to say that they understood the charges. When charged with the murder, Rodgers replied “not guilty” while Cresswell made no reply. 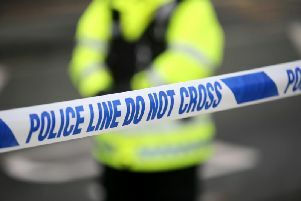 A Detective Inspector said she believed she could connect the men to the charges. During the hearing, members of the public could be heard weeping and sobbing in the gallery. Defence solicitors for both men, Seamus Quigley, for Rodgers, and Michael Magee, for Cresswell, said there would be no bail application. Both men were remanded in custody to appear again on December 20. As they were being led from the court, members of the public screamed abuse at them and a number of them had to be restrained by police officers. Earlier, the court had heard an application from the PSNI for an extension to allow them to question a 17-year-old for a further period in connection with the murder. They were granted another 36 hours.